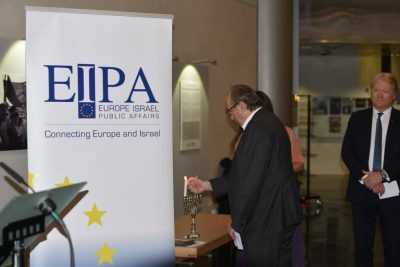 European Israel Public Affairs (EIPA) is a grand-sounding title for yet another pro-Israel lobbying group in the same general category as AIPAC in the US or CFI and BICOM in London. This particular group of lobbyists for nuclear Israel is based in Brussels, ‘right beside the European Commission, European Council and within easy reach of the European Parliament..’ as they proudly proclaim on their website. Their agenda is simple: to gain as much commercial advantage as possible in terms of political and economic ties with the EU notwithstanding that the foreign state they represent is in clear and gross violation of UN Security Council Resolution 2334 that demands the dismantling of all illegal settlements in the Occupied Territories of the West Bank, East Jerusalem and the Golan Heights. That resolution was passed with the unanimous support of all 28 EU member states. Yet this lobbying organisation has the ‘chutzpah’ to ask the EU for more trade and closer economic ties with EU members! In fact, many European nations are currently re-evaluating their trading links with a Middle Eastern state that so blatantly treats both the United Nations and the EU Parliament with such contempt. There is a contention that there should be an immediate ban on all EU trade with the state of Israel until such time as it re-joins the community of nations; undertakes to fulfill its obligations as a UN member state, complies with international law and respects human and civil rights. That will entail the return of all Israeli settlers back to their homes in Israel; the dismantling of all settlements on occupied Palestinian and Syrian land and the immediate cessation of the 10 year blockade of essential goods against 2m civilians in Gaza. Failing which, the state of Israel should be declared a ‘statu aliena non grata’. Any member of the General Assembly of the UN must comply with the resolution of the majority and any non-member of the EU wishing to maintain trading links with Europe must first be compliant with their obligations under the UN Charter and also under the Geneva Conventions on Human Rights.